Note: slides are available at the FOSDEM website. The talks were well attended and the devroom remained full all day. A theme that emerged throughout the day was that there is a change coming in science due to the increased use of and development of open source; and is not showing any signs of slowing down, quite the contrary. More scientists are thinking about how we should tackle reproducibility and sharing in an increasingly digital world with larger and larger data. Some areas suffer from a proliferation of proprietary formats or many non-standard and poorly documented formats. There can be many obstacles to sharing, and when the scientific instruments involved are very expensive it can be difficult to make changes in the short term. There is a growing realization that without open source, open data, open access, and open standards reproducibility is not feasible. It is clear that obtaining funding for software infrastructure is a complicated process and often not attainable, and in the face of sometimes very high equipment costs shared software infrastructure is often neglected. Furthermore, as science becomes more computationally intensive, investing in and sharing common code bases that can be reused and extended will become more important. The second day featured several talks discussing diverse subjects such as open source robotics and open source software in vehicles. Bill Hoffman presented the talk: Open Science, Open Software and Reproducible Code during one of the main tracks. He introduced the subject, talking about the history of scientific discourse and went on to discuss the current problems we face in a scientific culture where citations trump reproducibility. Is there any point to publishing scientific results if we can't take the input data, repeat the steps taken, examine the implementation of the algorithms, and get the same results? As we move forward computer programs are fast replacing mathematics as the language of science, and if you don't have to show your work, how are we to assess your research? The open source community has referred to open source development resembling the scientific ideal of peer review and building on the work of others in science, but now it seems that science could learn from the open source community. Github, SourceForge, and Google Code suggest sharing code is easy. The publishing industry should not make large profits and back initiatives like SOPA in order to maintain their position. The number of citations and Journal itself should not hold more weight than whether the code, data, and results can be reproduced and/or reused by others. 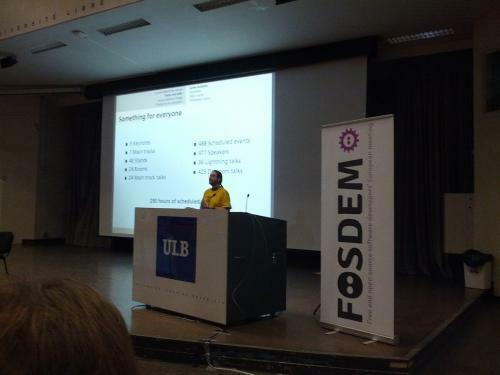 Many thanks to the organizers of FOSDEM and to the FOSS for scientists devroom.